Dubai: When it comes to recreating real life medical emergency scenarios without risking patient safety, the only simulation centre in Dubai seems to be up to the challenge. 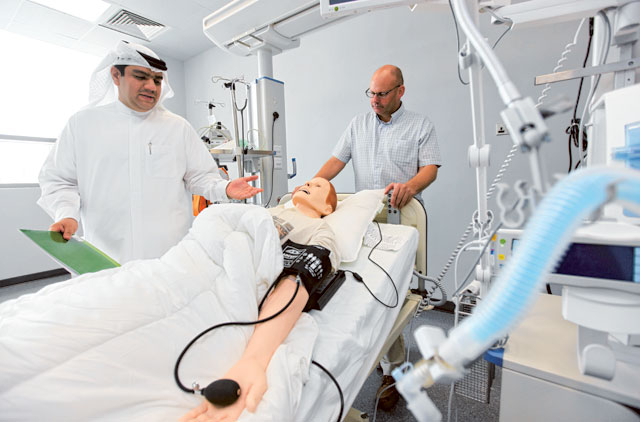 The six life-sized interactive human patient simulators or mannequins at the Khalaf Al Habtoor Medical Simulation Centre (KHMSC) at Dubai Healthcare City (DHCC) can blink, suffocate, choke and show symptoms of chest pain depending on the scenario being created. They have a pulse and heartbeat, pupils that react to light, and can spurt blood. Some are even capable of verbal communication. 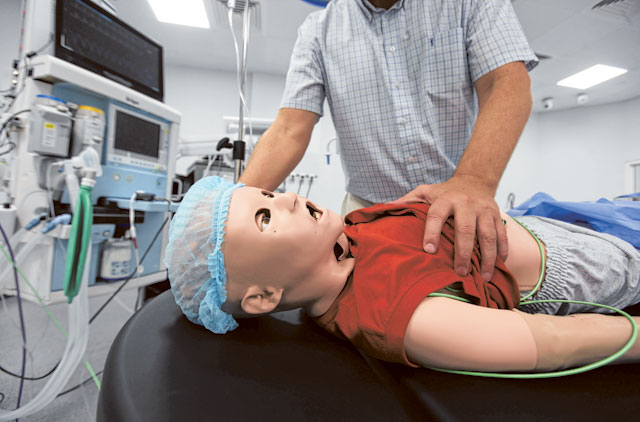 In a clinical setting, these high-fidelity patient simulators - man, woman and baby - help health professionals, up to 12 in a group, learn how to handle an emergency, communicate with patients and work as a team - hands-on. Through mock scenarios, healthcare professionals train on the computer-interfaced mannequins to practise life saving skills. Speaking to Gulf News in an exclusive interview, Dr Amer Ahmed Sharif, Managing Director – Education at DHCC said that the simulation mannequins show the behaviour and symptoms of a patient who might be experiencing a range of problems from respiratory to cardiac, and diabetic and newborn emergencies. The 30.000 sq ft Centre, under the Mohammad Bin Rashid Al Maktoum Academic Medical Centre (MBRM-AMC), the education and research arm of DHCC, includes high-fidelity operating rooms, adult and paediatric intensive care units, general wards and a maternity room. “It’s like stepping into a real hospital,” said Dr Sharif. The Centre has since its opening in November 2012 trained more than 200 medical professionals. The professionals – doctors, nurses, allied medical staff and medical and nursing students, are from universities and hospitals including the Dubai and Rashid Hospitals that handle trauma cases and Latifa Hospital, the largest maternity and children’s hospital in UAE. Dr Sharif said various studies support simulation in healthcare training. He explained that through simulation, healthcare professionals have the opportunity to utilise their knowledge and skills in a risk-free, true-to-life medical setting. “When they return to the real medical environment, they feel more confident, thereby improving patient outcome and enhancing the level of patient care,” he said. Dr Sharif said that along with medical training, there is emphasis on communication and team management. “We have conducted more than 40 courses, including customised courses for hospitals. We have an agreement with the United Arab Emirates University (UAEU) that has a smaller simulation centre,” he said, adding that the Centre provides a platform for training and learning to further Dubai’s position as a credible leader in medical education. Ian Ballard, Senior Simulator Technologist at the Centre explained how the simulation scenarios work. Speaking to Gulf News, he said, a mannequin, playing the role of the patient, exhibits the symptoms of the scenario and responds to the interventions. The trainer, who watches remotely, controls the mannequin. Sometimes the trainer talks for the mannequin instead of using pre-recorded responses. The session is recorded and played back for assessment during debriefing. To sum how what a simulation mannequin does, Ballard said it reduces human error. “Trainees immerse themselves during a simulated emergency, responding to a simulator mannequin as they would a real patient. Initially they might think it is just a simulation, but as the medical symptoms take over, the involvement focuses on treatment – not whether the patient is real or plastic,” he said. Speaking to Gulf News, a trainee of the simulation centre Dr Muna Al Jallaf, who is the senior chief resident at the Emergency Department, Rashid Hospital, told Gulf News that the simulation training is vital to practice medicine in a safe environment. By the third quarter of 2013, the Centre will have a pre-hospital training facility for simulated trauma like car crashes, featuring ambulance environments. It will also host an international conference on simulation in healthcare by the year end.